Last night when I told Esme we were making invitations for a birthday party, she told me she had already done that, there was juice and pizza and balloons. That was Gwennie's party. She thought for a moment the party might be for the boy we were inviting.. and then I think she has it now that the birthday party is for HER. It might not have sunk in entirely... but she was VERY excited last night about it and ran around the house like a crazed child for a while... I don't think the presents idea has sunk in at all, and I'm not going to remind her about that one until much closer to the day, or on the day! I still need to get supplies to make orange and blue/purple cupcakes. She is picking up other phrases like 'I want to talk to you bout sumthing...' and 'candy corn, bag of some is over there', 'there is a piece left (puzzle and blocks)', 'we are busy, both busy, two busies', 'I want to watch you with the knitting'. She has said a few other things the past two days that I will have to try to capture the syntax on... a few of the gaps seem to be filling in that used to be there. note: Mark suggested we buy her a box of binder clips for one of her birthday presents - cheap, she enjoys them (she clips them together and builds towers out of them) and they always have other uses. I know that would look odd being opened up in a birthday party environment! Binder clips! But look at that smile! Why does she need binder clips? Haha. Esme's birthday is next Friday. And, we have finally decided to do something more than Grandma's house for her.. Although, I took a long time deciding on it. We will invite two coworker's children and go get ice cream :) Mama will make orange frosted cupcakes as she was VERY wild about the orange and purple cupcakes that she saw at a store a few weeks back. She is also excited about this. I told her we had to make 'come to our party' cards and she got even MORE excited. She told me she wanted to make pink invitations - but then settled on green and red and when I asked her what animal - she said elephants. She told me three times what she was going to go get - I understood none of it. However, this is a common ensemble for her - the glasses and hat. The glasses are from a Mr. Potato Head toy and they have become one of her treasures she hides and finds again and again. The magnifying glass was something I picked up for her a few weeks ago (1.00 in the stationery section) Thanks to Daddy for grabbing the camera for me while I was shelling beans ;) She then went riding her bike with her miniature broom stuck up behind her as a flag, her magnifying glass and glasses in the 'trunk' of the bike and her hat on while bumping into things and saying 'Excuse me Tarzan, but but...' and swearing to me she was a little girl, not a Jane. Esme's games of the day are Monkey GO Happy Marathon and Conquer Antarctica. She has been having fun all morning with those. This is proving to be an interesting spurt and I have been really interested by some of the questions she has brought up to me lately - and the things she focuses on. I started the new dress. It seems to be coming along well. Then I kicked myself into gear and went out to the garden... several tomatoes and cowpeas and three tiny sad radishes. This is mostly still coming from the March-started garden.. still going after all these months. The fall plot was not a good success - should have started it in July as the beans are just beginning to flower and here comes a frost this week. I will sew the dress a bit more and then go make soup for the week. Mark is cooking chicken. We are all very glad to be home! Not much to say, this pattern has arrived and I hope to work with some of it tomorrow. I have some spare fabric I should dig out and put in the washer. I have red gingham fabric and some last of the Animal Town fabric to put together to make the dress on the right. I will need to find more (~ 2 yards of something) to try the coat with before I use my more expensive pink calico. We also have a large grocery run tomorrow... we've been putting off all but the most important things for about a week. A while back someone at work gave me a set of 'mini-puzzles' that have three letters each, and a picture split between each letter piece. Esme brought them to me a few nights ago and said 'This is my bag full of animals.' There are several of them that have animals on them - cow, pig, cat, bug etc... What impressed me this time is that she actually took care and time to place the extended parts from one piece into the gaps in the other piece, straightening each one out and going over it with her hand to feel it 'pop' into place. She used to try for an instant and then start crying and telling me to do it. She was so proud of herself when we finished all of them. She might be old enough to get another 9 or 10 piece jigsaw puzzle. She used to love her puzzle when she was <2 years old although all she could do was point where the pieces went then - couldn't manipulate them at all. I have a Poky Little Puppy Puzzle 24 pc. somewhere around here - but that is TOO many pieces for her, still, I am sure. There was a kit of 'Infantimo' mini-puzzles very similar to the ones Bob gave to Esme on Amazon. They are sized a little smaller though, and as Grandma pointed out - she doesn't sit still for very many people. Usually she sits still with me when she has focused in on a task close to bedtime. When she visits Grandma though, she is ON and active - running and seeing what trouble to get into etc etc.. I've found myself asking her to repeat herself more often than usual - tonight she said she was mad at me because she didn't get to walk on the rocks. I had a hard time understanding that mostly because I didn't expect it. She meant she wanted to come walk on the gravel in the yard barefoot to come greet me at the truck - and I came in too soon or she couldn't get Daddy to open the door in time etc..
She also told me we were Fraggles, we got out of the room! I had not heard her say 'Fraggles' in a long time. She has also been 'walking the Egyptian' downstairs for several days - I think she saw that in a Pocoyo episode? She is really going to like her Ellie for her birthday - as there is an invisible Ellie playing with us day after day. I tell her I love her and she says 'Thanks! I love you, too!' She has been talking a lot about Grandpa and Grandma going to the doctor in the truck. What doctors do (and farmers and firemen and ladies etc...) has been a large source of curiosity and deep thought lately. She asked me if my hiccups needed a doctor the other day, and found her stethoscope later. Extra that she showed me tonight when she was in a drawing mood: She can draw a face, a circle, copy a square and a triangle (but not do them from memory), and draw some letters from memory. I have been heard in public to say that I find making pants boring. This pattern heard me. This was the wiliest pair of pants I ever have tried to sew. Finally, I got them done, after two mistakes - one from being distracted (a big one that took an hour to remedy) and the second was just not interpreting directions properly. They're done. They fit. I see no reason to make a second pair this way at the moment. 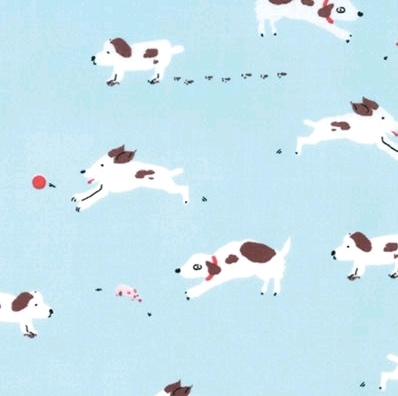 So - I cut the doggie fabric out of this pattern, tried and true, used for the past year or so. It took me an hour, where the other took me about four. So we are up two pairs of pants, and my next day off is Friday. Other: // I want to record this as a time when Esme is going more 'abstract.' She is telling me about time, and dreams (10 minutes? when asking when we are going to leave the other morning, first this then that about things she wants to do, 'eat this later' about food she wants to put in the fridge). She told me contents of dreams she has had in her sleep and can recognize when characters in tv shows are 'having a dream', now. We've talked about dreams being in your head, and I also had to explain what it meant "pictures in your brain, when you close your eyes and still see pictures they are in your brain, inside your head". I told her she could remember what strawberries tasted like, it was in her brain even when she didn't have strawberries, or what Nova's ears looked like when she was upstairs... I think she got it, but time will tell. She used the WORD 'dream' today several times, which makes me think she did get it. She is also understanding a lot more of what Mark and I are saying to each other (when she lets us talk - have to work on that). She is picking things up everywhere - and using them, and we are having to stop and realize we understand what she said, it was very 'pat on' and maybe we have to sit down and have a talk about it. And she understands what we explain to her better than before, as well. Also - she is picking things up like imitations (started imitating MY imitation of Mickey Mouse, then told me it sounded more like Itchy and Scratchy), dance moves she sees on Youtube just for a few minutes, and imitating other things like a flyswatter end put through her hair tie to pretend she had an arrow in her head (like a cartoon, she said) and a xylophone stick on top of her head and beeping to pretend she was an alien baby out of another cartoon. First off, very glad to see Grandpa home and hope he is doing well. Mark says he does seem to be. I have tomorrow off but probably will not visiting out of general caution - people at work have not been well, flu and sinuses etc. Grandpa will need his energy and Esme takes much of OUR energy even without recent hospital visits... Take care Grandpa! 'slow' bird caught this worm, one year later! Patience paid off... this item is coming in the mail. It was November 2010 when I saw one I really liked but wasn't the right size or anywhere near what I'd pay for it.... I'm very happy thinking about making this coat! Pants are on the agenda for tomorrow. The fabrics are coming out of the dryer now. The last pants that are not terribly highwater on her were 21.5 inches before they were hemmed at top and bottom... may need to extend that just a tiny bit more... not much, though. Will need to locate my elastic tonight, as well... and see if a trip to town will be needed or not. Miss Judy at work wanted to see Esme again. She could not believe she was that much bigger than she was in March. Oh yes, she is! Because she can't read yet - I can report here that Esme's birthday and Christmas surprises came in the mail today. They are tiny, but detailed - and she will love them. The day is approaching fast - less than two weeks. I still need to get frosting for her cake, and some paint for another gift. We have plenty of balloons and candles for the cake... maybe another practical gift like more socks. I had a package hidden around here the next size up... can't find it! Will have to look harder. //found// all I had to do was complain loudly to the air.. and the next time I opened the same box - I saw them. ?? //Sunday// Pants! Working on them. I really had enough of everything, so we decided to stay home and keep warm. I am cutting out a trial pair of pants and ready to start piecing them now. 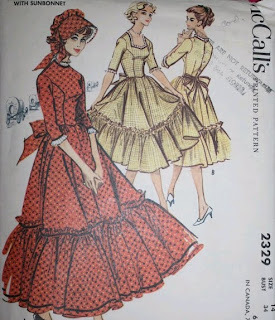 I'll want to dig in my stash later and if there isn't something to 'trial' the coat pattern (when it gets here) with I might buy a few yards of plain red fabric. That always gets used here or there, and can combine with the red and white striped fabric I've been keeping stashed. same pattern I made her blue coat in July from. This pattern is different than all of her other pants in that it has elastic only in the back - and a flat waistband up front. That is a challenge -- going to attempt. The other one was more fun and normal - she took the xylophone sticks over to me about ten minutes later and looked at me, looked at them... they are round balls with long wooden sticks on them. She pulls her chair stool up to me where I am cutting up vegetables and sits down prim and proper with her knees crossed and holds the sticks with the round ends up and moves them up and down vertically... while adjusting something invisible with one hand every once in a while. She looks up at me and adjusts imaginary glasses. "I'm knitting. I'm knitting a blue dress. See?" Again. My child. imitating me. And making me feel like some Grandma out of a 1940s postcard! Some days you just have to shake your head.. laugh.. and know she gets it from the both of you. Everyone is on the way to get Grandpa back this morning, except me.. I have to work again. Hope everyone has a safe and happy trip. Grandpa went into the hospital yesterday, and Daddy and Esme and Grandma all went to the big city to bring him there. We hope they take good care of him and get him ready to come back home. I cleaned the house quite a bit while everyone was gone in the morning and before I went to work.. Mama was worried. All my loves out on the road at the same time! Mark said they had a good time at a bookstore and Esme showed me her 'music house xylophone toy' (I don't know why she calls it a house.. it has a box?) and is enjoying it a lot. Thank you Grandma! 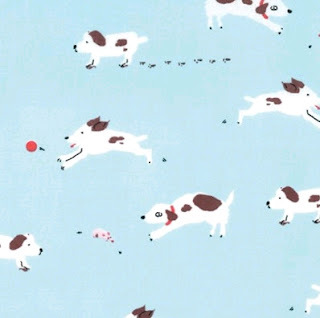 Esme's 'Sherbet pips' doggie fabric came in the mail yesterday. I've decided the majority of it will be a pair of pants - as her red doggie pants lasted for so long as a favorite. I'll need to wash it and some other things to have prepared for next Sunday, my next day off. I have not been out to the garden since the first night it rained here... several days now. It has been so cold, I wonder what I will find! The other day I did a 'health check' at work that was free... and expected to see very bad numbers. I did the check because I wanted to know if I was doing bad or good on 'pre-diabetes' numbers... I'm doing good. Besides family inheritance, I don't have any of the risk factors right now. Although, I could stand to lose another five lbs perhaps - losing the amount I did this summer was very good and put me right AT the top edge of the number for my height. Also, the lady put the blood pressure cuff on me and stared at the numbers.. looked at me and said : 'Do you know... (stopped because she saw the look I was giving her) do you normally have low blood pressure?' I said - 'Yes, but I wanted you to tell me I did or didn't... in case something had changed.' I was not quite in their range for being marked as hypotensive(extremely low blood pressure), but very close. So - more garden soup for me. It's been doing good on me. Sometimes I just have to stand back and readjust the mindset a little. And stop measuring legs ;) except for the pants. Thank you to Daddy for taking pictures of both of us. I hope Novia sees them, as she was asking for them on Facebook. Mama has an upcoming career as a mad scientist, eh? 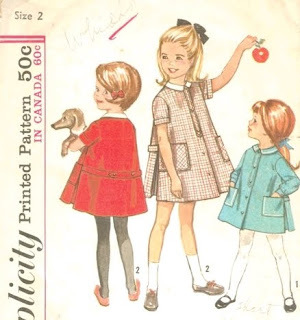 Esme's dress: Simplicity 5137, size 5, dated 1963. Sewn with no alterations except for the shortening of the skirt by half. It has a 7 inch zipper in it, and will need longer ones to keep her from growing out of them so quickly. With 9 inch zippers, these will make excellent winter dresses. My tunic shirt is the 'smash together' I was talking about a few days ago... needs a lot more work to make it fit me better, but this is usable, definitely good enough for working at home. Both Esme's dress and my shirt were made with bits I had but did not have large investment in. There are other fabrics I will be happy using for her dresses now that I have a good 'plan of attack', ie: a pattern that is proven to fit. //Note// The other day when I cleaned Esme's room I threw out almost everything underneath her bed. She saw it - and didn't cry as much as I had expected. Tonight she woke up in the middle of the night and had peed the bed - and I changed her bed. She hugged her Cookie Rabbit and Mr.Frog (her favorite lovey toys) and asked if they were 'ok' and they didn't get peed on, and they didn't have to go in the trash. I know maybe now why she shoves them way up under her pillow in the middle of the night - so nothing happens to them? It also affected me quite deeply that she thought I would throw them out... Mama is a meanie? There wasn't a lot under there that she really played with anymore, maybe a book 'The Magic of Everyday Things' that was not saveable, but I did know she liked. There was also one item that I did feel quite badly about throwing out on her, a cow flashlight she got last Christmas from a friend of mine at work. I dug it out after I put her back to bed and washed it with bleach downstairs - it wasn't really that bad, I just worried about the openings for the speakers hiding things I couldn't see.... It is bleached and waiting for her on her desk this morning. Mama is a softie, actually. I went out to the garden this afternoon not expecting to find much... and was very surprised. Pleasantly so. Remarkably so. This is the middle of October, and look at all of the RED tomatoes. Some went into soup immediately, and some will go into a pizza or more soup to freeze tomorrow. There were also quite a lot of peppers - pimento, orange (well, green.. but they would have been orange) and plain green bell. I cut those up for freezing. Some of them are Cherokee Purple, a few Black Prince, and Mark thinks the others are Jet Star and Brandywine. One Mr.Stripey yellow tomato to the side and there was another half-bad Stripey I cut immediately to save the good parts out of for the soup. And that is without getting nowhere near the amount of cowpeas and beans that are out there. I need to do more with them tomorrow, now that these tomatoes and peppers are taken care of. 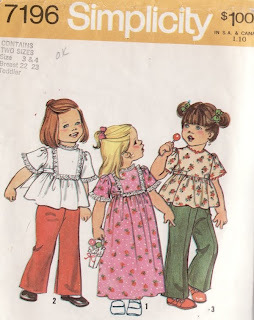 I had made a dress from the pattern on the left way back nearly two years ago... long before Esme would fit that size. It has been put away in the 'future box' since then. I took it out and washed it and today, it seems to be just a bit too big on her... not swamping her as it would have then. The sleeves are the right length. 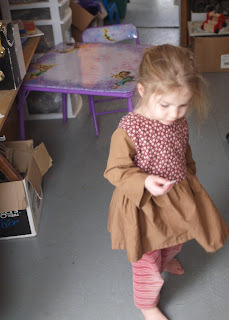 The skirt is very long - but I followed the pattern instead of making it shorter, as I usually do so she could wear it with pants. It also did not have the back ties I'm used to seeing on her. 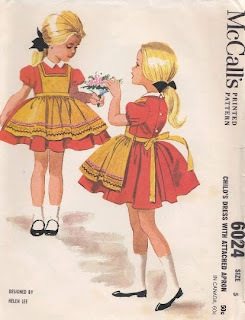 With back ties and a shorter skirt, it would be gold for making her next dress out of. 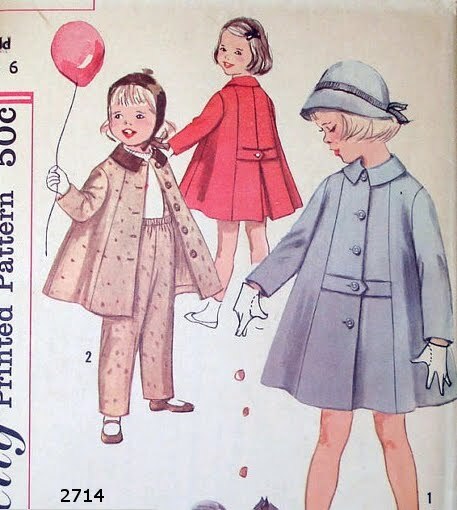 I have a coat pattern also, that is pictured above and similar to this other one. I post this other one because of something in the instructions that caught me and held. 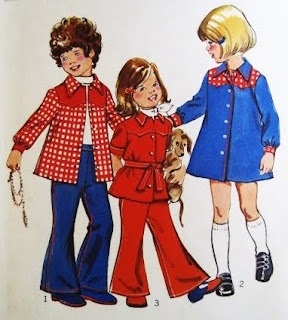 "Matching pants are lined and have suspenders, side zipper, elastic waistline casing and knitted anklets." Knitted anklets? What a beautiful idea! It reminds me of something very old I had as a child, at my grandparents house. A pair of heavy cloth/denim snowpants (instead of plastic coated!) that had a white cloth lining inside and ribbed cuffs at the bottom sewn on. It was such a warm cozy feeling not to have snow coming up into your pants legs. Where did that idea go? I have the weekend off, and a lot of closing shifts next week. Maybe I'll get more done, but probably not. I had a headache to beat the band yesterday, that had started the day before. I'm feeling okay today but not as ambitious as usual. We might go to town and we might just stay home and loll (which for me, always is more.. but I have to work myself up to it). Esme is watching 'Tarzan' for about the twentieth time since we bought it for her last week -- our brains might explode if we watch it much more! I've already caught myself humming the music to her while I am sewing, making food etc... and she catches on and starts to sing 'mama monkey and baby boy' song. That is a toy car, a baby toy car, it is so cute! (tiny smart car in parking lot). I want to go to that house, the happy birthday house, PLEASE?? We go there find toys, go happy birthday. 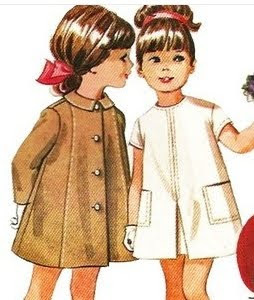 (dollar tree store across the road, where we bought a balloon for another girl last month) I told her I would wash a dress that was put away and see if she had grown into it, maybe she could wear it for Christmas - and she said 'Santa give it pretty dress to me? For Christmas tree? WOW, let's wash it. (so innocent!) I want to share it with you, we be rabbits, you eat some and I eat some, it not so bad! (it not so bad??? we bought new french bread and this was the end of the old loaf we were going to split out for lunch). Mark and I sent in the order for Esme's birthday/Christmas items from Amazon. I am getting her the Pocoyo toys she actually pointed out she wanted on the screen - and anything else will just fall into place as the events arrive. She is such a happy and easygoing child - she doesn't expect tons of things and actually would probably be thrilled with one wrapped item, a bunch of balloons and birthday candles. We are lucky parents to have a little personality like this... I know it won't last like that forever and don't want to take advantage of it too much, either. I made paper dolls for Esme last night as part of our projects. I made her a fireman and a dog with a water hose to go put out a fire in a building. Then she said the dog got hurt - so I made her a doctor/nurse figure with a bag that came and fixed the dog's foot. Then she said there were people in the building, so I made her a little girl for the fireman and the doctor to save - then they all had to have pizza. Playing with such things and listening to her talk about painting while I was sewing, it makes me more confident there are lots of homeschool things we can work on over the next two years. She won't be the age they want for Kindergarten for another year or two... And although she is on the verge of reading now, and understands a lot of logic games - we can learn about like plants, animals, jobs, how to build things and how things are made... and on the way her language will continue to naturally get more complex. Every morning and when I get home from work she comes up to me now with the request 'I want to talk talk talk to you you you Mama, I'm thinking... (painting/cereal/monkeys/do exercises) etc...' She is really reveling in the homeschool idea as Mama spending lots of time with her doing fun things. And she is saying more 'Esmespeak' that I have to stop and try to translate. ie: She told me I 'missed a spot' on her dress ties this morning because they were hanging looser than usual... so I tried to explain I just didn't tie them 'all the way'... that was a five minute discussion explaining what I was trying to explain. *shakes head* And at the same time I found her at my computer screen a few minutes ago pointing out letter after letter and having no idea what the words said.. but she wants to learn why I do this and what it all means. I have a yard of this coming in the mail from my sewing rec money. Esme picked it over the gray, which I was considering. She has a good eye, because the blue was half-price for a full yard and I was knowing a half-yard wasn't enough but not wanting to spend more than that. She's a good helper ;) The reason I was looking at the lavendar gray was that she has so many blue things already... hmm. I finished my second tunic shirt last night. 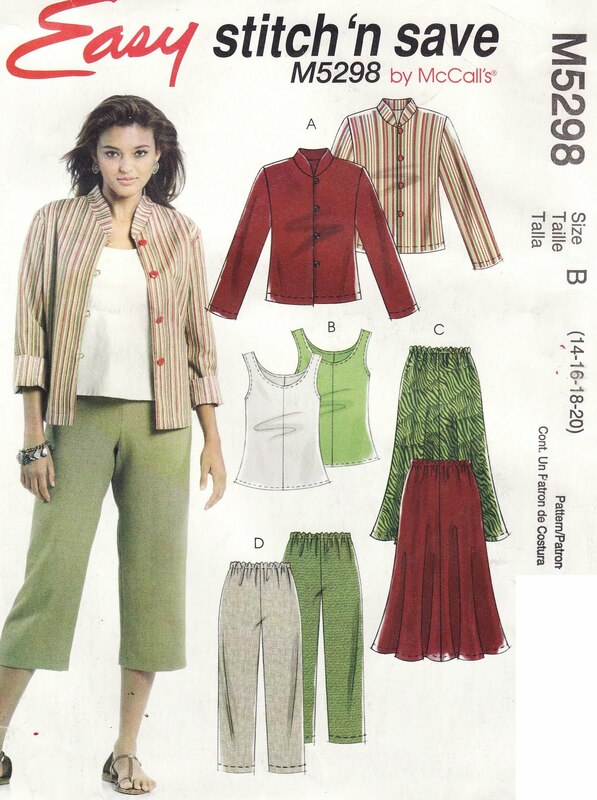 I am very happy with how this pattern has worked out - it is a smash-together of this jacket pattern (recent) and the following vintage tunic shirt pattern. The sleeves set in very easily and I 'make do' for not having enough fabric by splitting the front horizontally. I started with such a large pattern size 14, because my shoulders and arms are much larger than what is 'average' for my chest and waist size. That has made it difficult to find clothes off the rack that fit well enough in the arms without having large drapes of material about the waist. Combining the shoulder and arm width of the upper pattern with other details of the smaller pattern, I end up with something in between. The sleeves set in like the jacket, with a different armscye shape. Adding ties at the sides draws some of the material to the back but still allows me to get my shoulders up into the garment. It still needs work particularly in the neckline and the back lower armhole needs 'something' to not pull when I cross my arms across the front. I think there is more paint than truck by now. We didn't do a lot of 'homeschool' today, just let her paint paper and paint the truck again... talked a lot and played imaginary games. I brought my shirt down I needed to sew and got quite a bit of it done. Daddy made chicken and set the trimmings to boiling for broth. I put spiced tomatoes in it and onion powder and Esme actually had a good amount of the broth herself. I've saved some of it for her and put another half of it in the spinach I had the other day to bring to work tomorrow. so I'll have to wait for it to come up at another time. 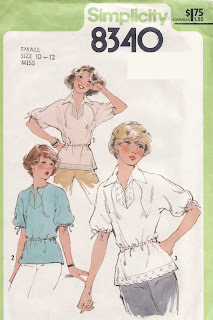 This pattern has really interesting side pleats and back belt, which intrigued me to track it down further. 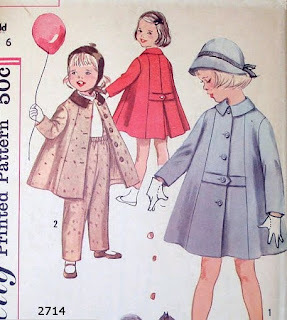 It has several features that would have me choose to do it over this coat I do have the pattern for, Simplicity 5337. It would be an interesting adaptation from a few things I do have. I still have not started the pink coat I intended to make this summer... but then, I made that blue coat in July and it has been very useful. I intend the pink coat to be heavier but want to put more thought into it. Esme's three blue dresses I made for her early this year (February, February, March) are needing to be replaced sometime in the next few months. I will scrape what I have in the fabric stash up and see if this weekend off can plan/start the first replacement. I don't think she needs a size up from these dresses, just one or two nicer looking ones for when these get too badly stained. Everything else needs to be went through again and sorted by how well it fits - so I know where I'm at. I know there are 2.5 year old raglan shirts in there that can be cleaned out. Everything recent could probably 'ride' for another few months if it was necessary... which it isn't. Mama likes to sew, and that is why I have this stash ;) I have a shirt cut out and waiting to be sewn for myself, as well... might try to knock that out today. It is another tunic shirt with the back ties as the last one has been really useful. Esme has been playing this game: 'Droppy', and can get all of the levels herself except #5, which has some reading in it of directions she doesn't understand. She really has this 'poke around and see what things do' part of the flash games worked out, but can't get the little codes or pattern matching they sometimes have hidden in there. If it is a matter of finding a key and putting it in a lock, or prying open a door with a stick picked up off the ground etc.. she uses her logic and knows what to do with it. 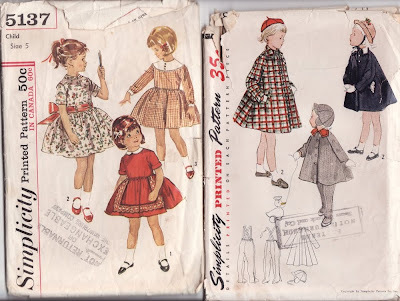 Patterns I have marked for 'later' to buy and sew, someday. I would have to alter or find the right sizes for them. LATER: Was looking at all of those patterns stalling doing something I knew I really needed to do while I still have one morning of sleeping in ahead of me :) Mark spurred me forward a little - and I'm glad he did. Pulled apart Esme's bed and washed it down of all the junk she got caught in the corners of it. Washed the floor everywhere around where she eats and under her old changing table. Took bleach to a large area of the shelving she used to use more often than she does now. Kept the roll going and washed down her table and computer desk. Moved to the kitchen for the last leg and mopped most of the floor down and around the dog food and water dishes. I'm a simple girl when it comes to that - I just want a simple mop that can be washed out in the shower and reused, and that the head does not come off of the mop every few minutes! Mine does the latter... so often I am doing better to actually just sit down on the floor and scrub. Now I know my back hurts much more than it did last time I did that much crawling around the floor... getting older, but it was worth it and I keep reminding myself that dirt is coming up, getting out and getting gone. There is more that could be done.... but now it is time to sit and eat some chips and knit on the blanket and drink coffee... I have tomorrow off, too. I mention that last bit because I was reminding myself last night - hopefully I can remember to remind myself as it comes up then, when my back hurts I will keep moving - maybe not in the exact ways that made it hurt (putting toilets up on three foot high shelves etc.) but I will keep moving, walking, cleaning, staying active. I have a deep belief that is one of the things that made my mom get sicker and sicker - when she hurt, she stopped doing things because some of them hurt... and then with her diabetes (which I do not have, but have a good chance of getting if I am not careful and maybe if I am careful) she put on more and more weight, which made her back hurt more, and then she deteriorated further and further until now she is at the point where her weight interferes with doing nearly anything. I am very scared of that. I want to take after my father in that regard.... I'm really hoping I do. Thought I'd sit down - but went to wash my hands and the bathroom sink being slow running got to me again. Put the mop bucket under it and cleaned out the p-trap. YUCK and yuck and yuck. But, success. Note to myself for the future - when putting the pop up clip back on, make sure the round nubbly circles are facing towards the front. I have been a plumbing specialist for how long and still failed on the first reassembly on my own faucet? And I even had the luck of having it put together for me the first time but hadn't taken a good solid note of that fact. I got a frame-like piece of wood today salvaged from some packaging. I hope I can turn it into a second easel for Esme, it is going to take looking at what other materials are in the garage and making a plan for it. She said she didn't want black shoes - she wanted pretty shoes (ruby slipper type), that the pretty shoes were "shoes to be a kid". I have no idea where she got that wording, but wow, was it salient. I felt bad being the mom telling her she had to buy sensible shoes! So, I did let her try on the pink Hello Kitty shoes but she told me they did not feel good. So after that, she seemed to be happy with the black Mary Jane shoes. The ones I had intended to buy her were somewhere in between - brown with flowers, but the straps did not fall across the ankle, and in the past she has not done well with straps that were further forward.. kept falling off her feet when she ran. Esme spent some time with her Grandma yesterday, which was wonderful :) She must have expended a lot of energy as she was crashed when I came home - and only the promise of going painting made her agree to get up. We worked in the school room until about ten, and then I made her pack it up as I have this insanely early morning today. Grandma asked about her shoes - the only pair that seems to fit well right now is her toddler size 11 sneakers (the black ones), but I have my eye on a pair of Hello Kitty shoes she pointed out to me at WM and want to take her in with me to try a pair on this next day off I have. I think it will still be 11, but don't want to buy a size she is just about to grow out of! Other than that, I'm gathering ideas and making a list for her birthday which is approaching faster than I want it to. She has pointed out a few things she wants to me on Amazon, and I'm working at getting those. I want to take her to the bowling alley with two coworker's children sometime in November as a treat/post-birthday event... but have to see how much that would be and Mark isn't keen on the idea (social event etc.). I still intend a regular family cake and presents sort of thing like we have done before. Esme did well with her projects last night. I had her draw a letter and a circle - and then she painted for a while, and I took ideas from our painting and ran with those to make a caterpillar to glue together which she really enjoyed, then she painted some more, and we did our elephant counting sheet I had made. She keeps "reading" me stories and painting keyholes on cardboard and 'opening' them with a paper key looking for treasure. Basically I want her to get used to the new 'idea' and work on finishing some projects and listening to me about new things. She really does like to see her work taped up on the wall and remember what we did before. Already we are about 75% there -- she wants to do all the fun (painting), but gets frustrated quickly when something is hard or when she begins to get boring. Exmaple: it was getting hard to squeeze the glue bottle while she was gluing clothes on a bear, so she wanted to glue them all on his face to be 'done'. Maybe I should have let her? I didn't - and she did finish, and she had fun having him talk to the lady bear I had made earlier. She also cried so hard at having to leave the room for the night. I told her we could come back tomorrow if she was good... I am so tired, need to sleep! I was printing out an elephant sheet of Mama and five baby elephants to count/color and Esme saw it - was all ready to march downstairs with it to the 'school room.' She was so unhappy when I said I was just preparing it for tomorrow. She wanted to go all over again! Or is that my kingdom as a box? Remember that awesome box I scored at work the other day? We finally got to working with it. It is the perfect castle shape, so I gave it a drawbridge. C'mon Mom, you can do it, come in! The Mayflower beans are about to give two seed pods and the Shackamaxon have a handful of swelling pods waiting. And on top of those I am 'reserving' there are pounds and pounds of regular beans coming in! With gallons of soup frozen already, I need another way to use these without having to blanch them the regular way (getting them cold enough afterwards is the part we keep failing on). Combine all ingredients except crumbs in greased casserole; mix well. Top with crumbs. Bake at 325 degrees for 45 minutes or until bubbly. Lemon cornmeal cookies<--- gotta try this! Make do and mend book on Amazon. This book really is the epitomy of what I was taught as a child - and what I still do as an adult. It is a reprint of what was distributed in WWII to families to help them through the hard times. I'm sure I've seen bits and pieces of it over the years, but never the whole thing. I read through what Google Reader would let me and was amazed at the quality of the writing, illustrations, and examples. It is a shame that fewer people have these skills now, especially as this nation is beginning to need them more and more. I am thinking, if we cannot make more money in this economy, how to do with less and stretch those things we do buy and those things we already have into more enjoyment and more meaning. And it also makes me think of how I grew up, and what I would like to pass on to Esme. I remember a time when I was Esme's age, maybe just a little older, four and a half or so? My cousin and I were outside and fighting over something the way that young children do. My grandfather called us over to a pile of wooden bits - he gave us some nails and a hammer and we each made a toy. Mine was an airplane - really just blocks of wood nailed together to LOOK like an airplane. The boards that made it up were yellow and blue and for some reason I was insisting on naming it Cindy. My grandfather, I am sure, was rolling his eyes and I know my grandma hid a laugh. This instilled great morals that things of value do not have to come from a store and can cost next to nothing yet bring hours of enjoyment. And, the enjoyment is as much in the making as it is in the use of the object. That has stuck with me all of these years. I found these fabrics last night after work... it was such a great find for very little money. Mark even said it was well spent. I was cleaning this morning and getting ready to throw away/put away some of the little assemblages Esme makes on her shelves.. and I found these all hidden away between some toys. She has been collecting treasures out of the buttons I let her play with, like a little magpie! Apparently she likes rhinestones! I can honestly call it treasure because her treasure chest was one of the toys piled on top of them. She had me paint a portrait of her - and man... I'm out of practice! It could be any little blond girl, it is not her in particular. I will need to practice and she will definitely help. If Esme had had her way, the arms would have been green and the eyes would have been pink and the face red. But she was impressed that I drew her dress green with pink spots - just like the dress she was wearing.. she thought about that and then decided that Mama did a very good job and told me so several times. She loved watching me mix colors, literally danced up a storm telling me 'the red is so pink - the blue the black the green .. it all blue! etc etc.. She dipped in and drew some circles on her own paper but was very hesitant, and then wanted me to do it for her... and I didn't. I started to fill the background on her portrait in with purple and she said 'no raining Mama, no raining on the Esme need a sun right there.' She has her ideas... I just thought it was a pretty 'Esme' type color to fill in with.. and she thought I was putting her out in the rain! It's almost here, she will be four next month. I wonder if I am going to continue the monthly updates once we reach the 48 month mark... and I answer myself that I will, at least until 5. But I'll drop the months ;) and find some other way to make it easy to search back. After all, these are for her as much as me - to look back on one day. Also, I am sharing it with you, the reader, up until such time she tells me this is all too embarrassing to continue. The way that is going, probably a few more years! But, I think five is important. A lot happened the last year. She is such a different child now than she was then, and yet, so much the same. Her world has expanded, and so has her imagination. That is what I want to post about this month. Her imagination. She now talks about ghosts and dragons and alligators and all sorts of things without any prompting to a subject change! She tells me things that I have to say 'uh huh... really?' on... like ghosts don't have teeth, and that food makes your teeth grow (which is true, kind of) and that capes make you 'super'. She wonders what ghosts do without teeth, and why they try to eat her? She tells me what doctors do, and what farmers do/wear, but still has a firm identity that she is none of those - she is an Esme, a little girl. She thinks she has this mommy and baby thing worked out - but it is VERY funny to hear her explanation of it. Such as, ghosts have mommies and daddies too, and they help them so they are not ghosts and can be alive. All of that was said with a washcloth over her hand in the bathtub and singing parts of a Muppet song from the Alice Cooper episode where they sing 'I'm looking through you...' ?? Some days I just don't know or plan on finding out exactly where it came from. She has these things figured out, and uses them often as matter-of-fact instead of just imaginary. It is an interesting ride when she really gets going on a topic. However, she still does not jabber one's ear off as some her age do. She thinks, and thinks deep. Then she explodes on you at unexpected times. She sings daily and often, and gets a lot of the words right to many songs - doesn't like it when I change the words, but realizes what a joke is now. She used to just get mad at me. Her deadpan 'no laughing' and 'no clapping' and 'don't say it' with a pouty lip is still a common occurrence. It is especially funny when she has said something like the 'Daddy isn't learning how to be a dragon right' when he was coughing smoke... and she is 100% serious, crossed-arms and everything looking at you. Classic. Sometimes, I will come to my desk in the middle of the day and find an assemblage of toys which will make me laugh. At this very moment there is a tiny wooden helicopter with a hole through it no larger than the size of a quarter. She has found a small plastic pig and put him into the helicopter so he can take a ride. I remember her last night spinning the helicopter blades and making it fly around, but I hadn't seen the pig at that time. In other things, we still have not learned the button-up shirts. I have not stressed it. I might work on her more with her jacket with the one button. It will come. She is extremely interested in computer games and learning how they all work and how to win. She has so many I can't keep track. At times, she is still interested in learning how to spell words and how to write letters. She still counts to twenty while skipping a few .. and I've heard 'eighteen, nineteen, ten!' recently said to a kitten. I think she wants to work on money more and will have to find her a plastic piggy bank or something she can put coins into - she gives me buttons and says there are your twenty cents. She has had very little regression on the PT - forgetting to take time one day etc...at least she got her own new clothes and put the wet ones in the laundry room. She is eating well and growing tall and strong. She is social and loving... empathetic and funny. I don't worry constantly about some of those things like I used to but Mark still has to pat me on the head and say 'Yes she is an alien and everything in the world is wrong with her'... and I get the point. I guess I get it from my mother.. *yipe* I hate that idea. Old habits are hard to break. Flipped through a magazine at work today and found only two pages that had anything I could possibly live with in my house. What does that say about me? Hmm... Good things, I think. I rarely see anything in a 'design' book that is interesting enough to save for the future. These are like what I saw. a bedspread set like the one in a magazine. Definitely would do a darker bedspread but the pillows were interesting - and the ones in the book had more of a 'black on light' square to them. Very sewable. It was in pieces and not very stable so I did not bring it back from Minnesota. I should have anyway, maybe it could have been helped some. Perhaps I can make something like it in a woodshop in the next few years or find something like it at a thrift/flea market type atmosphere. The one I saw in the magazine that reminded me of it was a warm honey/orange colored wood. The thing that attracts me most to it is the closeable slat top that also opens up as the writing surface. My grandfather's had a pull out flat board underneath that helped support the slant-top when it was open. When the tomatoes are coming out your shirt sleeve it might be time to stop picking them and go inside and get a bucket! Ha, had you wondering where I was going, eh? Lots more yellow tomatoes today - I indeed had my shirt so full of them that they were coming down the shirt sleeve as they overflowed the makeshift pocket I was putting them in. I think they must have been hurried up by the nearly freezing temperature last night. I need to pick the beans again but did not see them overflowing. A huge pot of soup is on the stove right now - yellow tomatoes, beans, cowpeas, peppers, split peas and leftover pork chop trimmings from last week's cutting. It smells wonderful. I brought a crysanthemum home from work that was on sale - and planted it in the garden. Everything seems to be doing well enough, except the radishes have a bit of yellow on them. I hope the frost doesn't come earlier than it is forecasted.